The Photographer&apos;s Ephemeris (TPE) is the ideal tool for outdoor photographers who need to plan shoots using natural light. Launched as a free desktop app in 2009 for Windows and Mac, we have since ported TPE to both iOS and Android. 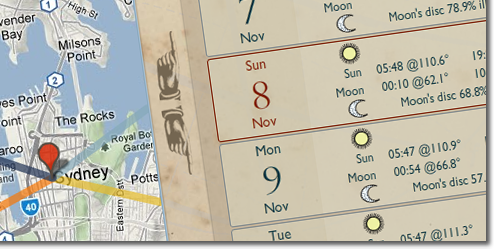 TPE is a map-centric sun and moon calculator: see how the light will fall on the land. TPE&apos;s map-based approach means you are not limited to a predefined list of locations, which often don’t include the places many photographers go. Instead, search for any place name on the planet or position the map pin exactly where you want it. Advanced features including automatic time zone and elevation detection, correction for atmospheric refraction and height above the horizon, ensuring that you have the best possible information for planning your shoot. You can even determine when the sun or moon will be visible behind nearby hills and mountains. Find out more (and download the free desktop version) over at photoephemeris.com.